The long marathon of Jewish Holiday ends each Fall with Simchat Torah: on this day, all the Torah scrolls are removed from the ark and paraded around the synagogue while people dance and sing around them. Every Shabbat a different portion of the Torah is chanted in synagogue, and it takes a year to complete the cycle: on Simchat Torah, the end of Deuteronomy is reached, and we start again from Bereshit (Genesis). Because its shape resembles that of Torah scrolls, one of the most traditional foods for Simchat Torah, found in Jewish communities all over the world in different variations, is stuffed cabbage. Italy is no exception: in Venice, we cook it in stock; in Rome they use oil, onion and tomato; others make a Sephardi version, using lamb instead of veal/beef; some add raisins and pine nuts. 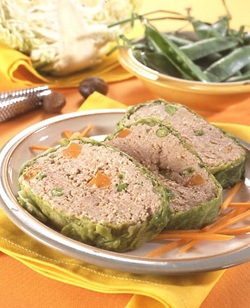 If you’d like to try something different, instead of stuffing each leaf you can make a large meat loaf and wrap it in several leaves: Italian Jews have many versions of “Polpettone” (meat loaf) made with beef or poultry and stuffed with different vegetables, frittata or boiled eggs, and encased in turkey or chicken skin, or in a goose neck. Soak the bread in meat stock and set aside. Blanch the best leaves of a cabbage in boiling water for 1 minute, drain and set aside. Heat the olive oil in a pan, add the onion and garlic and cook until soft. In a large bowl, combine the ground turkey, bread mixture (liquid squeezed out), nutmeg, salt, pepper, the egg, and after everything is well combined, fold in the carrot and peas. Allow to rest for five minutes and the mixture will firm up. Only if it’s still too soft, add some breadcrumbs to thicken it. 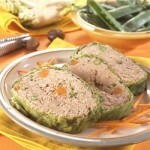 Shape the mixture into a meatloaf and wrap it in the cabbage leaves. Tie well with kitchen string (to make sure it won’t break you can also place the meatloaf in a muslin bag. Place in a deep pan, cover with stock (enough to reach the top of the cabbage), and cook on medium/low heat, covered, for 1 and 1/2 hours (checking every 30 minutes and adding stock if it’s drying out). Uncover the pan and if there is still a lot of liquid, allow most of it to evaporate. Serve with the juices from the pan.